Two Ford School undergraduate students, Alexandra (Drea) Somers (BA ’19) and Ashley Tjhung (BA ’19), were among the winners who received the Rev. Dr. Martin Luther King, Jr. Spirit Award. The MLK Spirit Award recognizes students who exemplify the leadership and extraordinary vision of Dr. King. Somers is from Ypsilanti, Mich. and has combined her passion for her city, education equity, and community building through mentorship at Wolverine Pathways. She enjoys music, praying, and friendship. You can most likely find her somewhere on campus at a meeting for an organization. She is excited to do service work before she attends law school because she aspires to work in education law. Tjhung is from Rochester, Mich. While at U-M, Ashley found a passion for storytelling and racial justice as the managing editor for Michigan in Color (MiC). In addition to her work at MiC, she is highly involved with the Michigan Community Scholars Program, Intergroup Relations, and the United Asian American Organization. The awards were presented at a ceremony on Jan. 19, 2019. 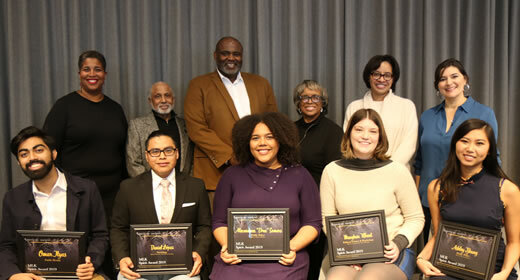 Ford School students have a history of being Spirit Award recipients for their dedication to diversity, equity, and inclusion.